I'm all for dishes that are fast, easy and delicious, especially when I'm trying to juggle a busy work schedule with, well, life! But there are days when I just want to slave away in the kitchen for the whole day to make an incredible meal. Chefs make it look so easy (when I well know it's not, but chefs are great illusionists, no?) Me? I just create a complete disaster in my kitchen that would easily get me kicked out of any chef's kitchen. But I always love the challenge of it all, as it pushes me to hone my cooking skills, use my creativy and trust my instincts. 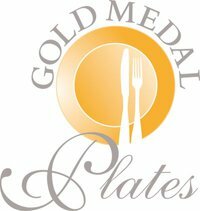 The Gold Medal Plates (GMP) have been well underway for the past two weeks. For those who don't know what GMP is, it is "the ultimate celebration of Canadian Excellence in cuisine, wine, the arts and athletic achievement." Founded in 2003, this year's GMP is being celebrated in eight cities across the country: Edmonton, Vancouver, Saskatoon, Toronto, Calgary, Ottawa, St. John's, Montreal and Kelowna. Top chefs from the first six cities have already competed, and St. John's GMP will be happening tonight. This annual event not only means a great evening of superb wines and food prepared by each city's premier chefs, but to crown a gold, silver and bronze medal culinary team in each city. The gold medal chef and his/her team from each city will go onto to compete in the Canadian Culinary Championships in Kelowna, BC, where they'll compete to be named the top chef in Canada. My friends Don and Jenn over at foodiePrints, along with Whisk: A Food Blog and Rachelle Eats Food, have been tapped by James Chatto to help promote the Ottawa chapter of the Gold Medal Plates competition. Over the last several weeks, they interviewed each chef who were competing in the Gold Medal Plates. FoodiePrints have also been hosting a contest in celebration of Gold Medal Plates, challenging their readers to cook like a Gold Medal Plates chef themselves. Last year's Ottawa Gold Medal Plates winner was Chef Matthew Carmichael and his team. Chef Carmichael and his sous chef from Restaurant E18hteen, Jonathan Korecki, went on to place third in the Canadian Culinary Championships, above esteemed Vancouver chef Rob Feenie. FoodiePrint's challenge to their readers was to recreate their own interpretation of Chefs Carmichael and Korecki's dishes from the "black box" competition of the Canadian Culinary Championships. Chefs Carmichael and Korecki's dishes? The quail was boned and lacquered with beer and soy, set atop risotto and garnished with threads of fresh thyme, lemon zest and fried garlic. The arctic char got a crackly skin treatment, served with fennel slaw and garnished with cubes of dragon fruit. However, they were adamant that quail, fennel, and arborio rice be used in our interpretations. For my fish dish, I wanted to keep both the look and the flavours simple so that it wouldn't overwhelm the fish. I love Arctic char and I really wanted it to be the showcase of this dish. 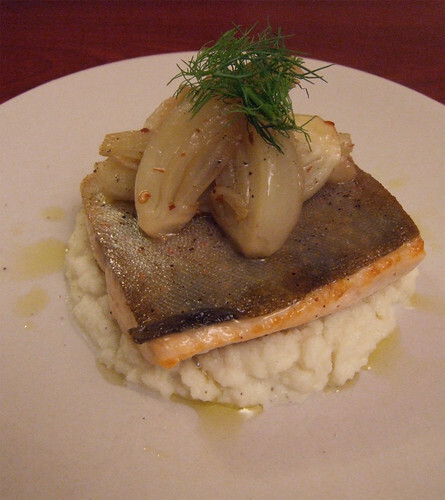 I decided to simply pan-fry it to get the skin crispy, served it on a bed of cauliflower puree and topped it off with fennel confit. The flavours are delicate but I thought it all came together nicely. Rather than a crunchy slaw, I opted to confit the fennel due to the season--being fall, I often opt for slow-braising and roasting. Slow-cooking the fennel in olive oil not only makes it incredibly tender and melt-in-your-mouth, but softens the licorice notes to ensure it doesn't overpower the fish. I really enjoyed this dish, and adding my own spin and interpretation to Chefs Carmichael and Korecki's dish was certainly a lot of fun for me in the kitchen. You too can challenge yourself and cook like a Gold Medal Plates chef! 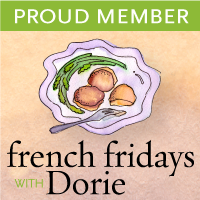 Check out the contest details here and enter your submission to foodiePrints, Whisk: A Food Blog, and Rachelle Eats Food by Sunday, November 21, 2010 11:59 PM EST. The winner will win a pair of cookbooks from Master Chef Thomas Keller (the winner of the Canadian Culinary Championships will stage in a series of Chef Keller's restaurants in California) as well as an evening observing a dinner service in the kitchen of his Restaurant E18hteen in Ottawa. Be sure to come back this Saturday, November 20 when I'll be posting up Part II of my Cook Like a Gold Medal Plates adventures, where I tackle quail, beer and risotto. To prepare the fennel confit: Place all the ingredients in a medium saucepan, ensure most of the fennel is covered by the oil. Bring the oil to a slow simmer over medium-low heat. If the oil seems to be simmering too hard, reduce the heat further. You want a slow, slow simmer that barely bubbles so that you're really slow-cooking the fennel. Simmer for 30 minutes or until soft when pricked with a fork, making sure to occasionally turn the fennel to ensure that all the pieces get submerged in the oil (they will as the fennel slowly softens). Drain the fennel, reserving the oil for another use (you now have great infused oil! ), and set aside. The fennel confit will keep in the fridge for about two weeks. To prepare the cauliflower purée: Heat 1 tablespoon butter and a drizzle of olive oil in a medium saucepan over medium heat. Add the onions and sauté until softened, about 5 minutes. Add the cauliflower, garlic and milk. Season with salt and pepper. Bring to a boil. Reduce the heat to medium-low, cover and simmer gently until the cauliflower is tender, about 15 minutes. Drain well, setting aside the liquid for another use. In a food processor, purée the cauliflower with the remaining 2 tablespoons butter and no more than 2 tablespoons of the cooking liquid. Adjust the seasoning. Keep warm until serving. To make the Arctic char: Season the skin side of the fish fillets with salt and pepper. Heat some olive oil (about 2 tablespoons) in a heavy-bottom pan over medium-high heat until smoking. Reduce heat to medium and place the fish fillets skin side down. While the fish is searing, season the flesh-side with salt and pepper. Sear for about 2 minutes, then carefully flip the fillets over. Sear for another 1 1/2 to 2 minutes, for a centre that'll just be barely cooked. To arrange: Spoon some of the cauliflower purée onto the centre of the plate. Place the fish fillet on top. 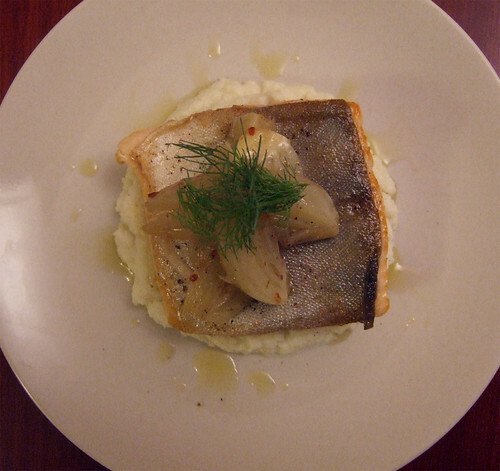 Arrange 3 to 4 fennel confit pieces on top of the fish, and garnish with some reserved fennel fronds. Serve immediately. Posted by Bonita at 10:00 a.m.